When Dragnet changed Jack's supporting actor from Ben Alexander to Henry Morgan, the cast and crew readjusted to them and the character roles. 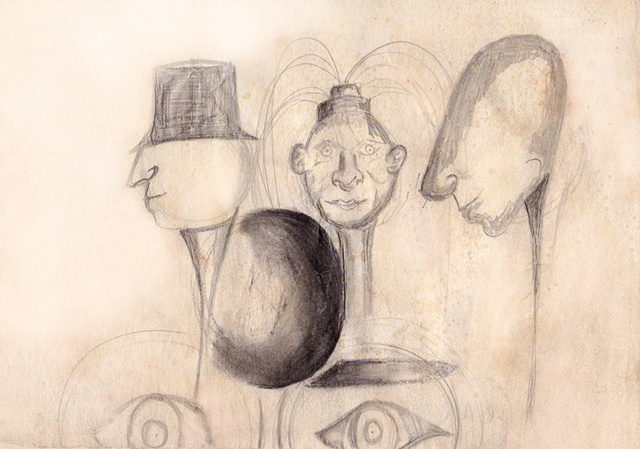 In this sketch, Jack is represented by the image in the hat. The image facing us in the middle represents Ben Alexander and the character image facing jack's back was Henry Morgan. Ben Alexander had an offer to play in another show (Felony Squad) and had many alternative interests and investments as a businessman and decided to leave Dragnet symbolized by the many tentacles resembling his hair. The show's cast and crew adjusted well and resumed productions as usual represented by the eyes in the lower portion of the composition.